Although classified as alternative rock, Bonfire strikes me as straight-up indie rock. Granted, they fall on a very gentle end of the spectrum, but they fall on the spectrum nonetheless. I get a strong Margot and the Nuclear So and So’s vibe, but it’s a more passive, less grunge-y version. 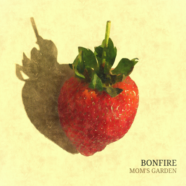 If you were to fall asleep to their newest release, Mom’s Garden EP (which is entirely possible, due to the hypnotic sound), you’d dream about floating in a pond under a cloudy, blue sky. With an overall calm feeling, the album creates a response that’s almost trance-like. Listening to the album multiple times is a sure-fire way to put yourself to sleep. The lyrics are painfully deep, yet vocalist Greg Demer’s execution is contrastingly level. This seemingly incompatible combination only creates more mystery. Rather than delve in, however, you’d rather just agree that life is confusing. While very solid, the instrumentals are more repetitive than passionate, adding to the melatonin factor. This album is not for pop radio, a party, or your morning commute. It won’t pump you up, inspire you, or drive you to clean your whole house. But Bonfire gives us something very rare to add to a music collection: an album to listen to when you don’t want to feel anything at all. Sometimes you need to just say “life is weird and I’m going back to bed,” which you can easily do to Mom’s Garden.